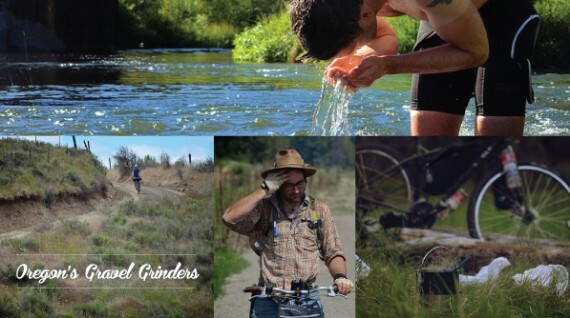 Donnie Kolb has been organizing gravel bicycle rides for the past five years. Usually keeping his events a bit on the down low — Donnie’s outings are unsupported, unsanctioned, have no entry fee and crown no winner — the Portland lawyer typically sees about 100 riders show up for his “bikepacking” adventures after posting the GPS coordinates of the route and a “We’re doing this on Saturday morning” message on his website, VeloDirt.com. Think big group ride with friends, albeit really fit friends. Last year, Donnie’s “Dalles Mountain 60”, a 60-mile single-day ride on gravel and dirt roads on both the Washington and Oregon sides of the Columbia River near The Dalles, attracted about 200 cyclists, the most yet for a VeloDirt ride. So when Donnie posted his newest and boldest route, dubbed “The Oregon Outback” — a 360-mile gravel epic that starts in Klamath Falls in far Southern Oregon and ends at Oregon’s northern border, the Columbia River — he figured he would have a hard time getting 50 other adventurous souls to ride the path he and photographer Gabriel Amadeus blazed last summer. To Donnie’s amazement, he had to shut down registration after 400 bikers emailed that they could not get their cycling kits on fast enough to join him. Welcome to the next big thing in biking. Gravel grinding, dirt road touring, outback adventure, bikepacking — call it whatever you want — interest in rides that eschew the pavement and explore Oregon’s abundance of dirt and gravel roads is rapidly growing. Whether using a road, mountain or cyclocross bike, cyclists are flocking to these often off-the-radar group rides that are all about self-sufficiency, exploration and visual beauty… probably with e a lot of climbing. Travel Oregon has taken notice of rides like Donnie’s and races such as the Oregon Coast Gravel Epic in Waldport popping up on the state’s cycling event calendar. The state already promotes Oregon’s mountain bike trails, popular road routes and designated scenic bikeways, and gravel rides could be next. According to Staj, a 15-person working committee on scenic gravel rides has already been formed, and select routes could be highlighted on the state’s bike-specific tourism website, Ride Oregon, in the next year. Of course, that remoteness is also part of the appeal. “The biggest advantage is most of the time there is no traffic or very little traffic,” says Donnie, who has bike toured on- and off-road throughout the West and Alaska. “And if there are cars, you don’t have to worry about them zipping by too fast. Eager to put your mettle to the test on an outback adventure? Check out these upcoming rides. Beau Eastes is mt. bike enthusiast from Bend and one of ORbike’s latest contributors. A version of this story also appeared in The Bend Bulletin.